India’s participation in the mega-trade agreement, Regional Comprehensive Economic Partnership (RCEP), has long been debated and sentiments around the subject are quite divided and divergent. Geethanjali Nataraj and Garima Sahdev (henceforth N-S), while inferring that the long-term benefits of joining the bloc far outweigh the short-run costs, state, “…if India wants its ‘Make in India’ to become a global success it must participate positively to become a part of the Asian Value and Supply chain which either begins or ends in India” (BusinessLine, January 7, 2019). There have also been compelling arguments that RCEP will facilitate micro, small and medium enterprises (MSMEs) to effectively integrate into the regional value and supply chains. Detractors to the above theses point out that India’s trade deficits with nations have always widened after signing free-trade-agreements (FTAs) with them, citing the cases with ASEAN, Japan, Korea, and Singapore, most of which are RCEP nations. However, FTAs should not be judged on the basis of trade deficit only, but also through the impacts on the participants in the commodity value-chain. At the same time, it has also been pointed out that India’s vulnerable agriculture and dairy sectors, which are not in positions to compete with Australia and New Zealand, will be exposed to vagaries of global trade. My contention in this article is, however, a bit different. I am not against India’s participation in RCEP. Given that this is the first mega-trade, I intend to raise six cautionary points, so that the costs of entering into this deal are considered. This is to create the understanding that what is being perceived as long-term benefit by N-S might turn out to be long-term costs. My propositions are: a) regional trade agreements like RCEP need not always be beneficial from the ‘Make in India’ perspective; b) impact on value chain from RCEP need not be positive; c) issues of complementarity in trade are still unclear; d) issues with services; e) raising relative trade barriers with non-members; and f) reduction in long-run trade policy manoeuvrability. For the time being, the geo-strategic issue of existence of China in this trading bloc is being left out, as India has been getting into bilateral deals with China under the RCEP umbrella. On the issue that ‘Make in India’ will be a success with India’s entry in RCEP, the fact, unfortunately, is that Indian manufacturing is not competitive enough to face the vagaries of a free trade regime. Even after 27 years of liberalisation, inefficiency prevails due to a host of unimplemented reforms in the product and the factor markets. Despite the implementation of GST with the idea of creating more efficient supply-chains, rationalisation of multiple GST rates is still a work-in-progress. Further, the compliance with the existing complex norms of GST adds to the transaction costs. On the factor side, labour market reforms are incomplete. Labour productivity in manufacturing is still one of the lowest in the world with spatially fragmented labour laws are escalating the costs of doing business. Given this, Indian industry is hardly in a position to compete in the level-playing ground in a free-trade region. If domestic industry has to thrive, it needs protection as also the enabling conditions created by factor and product market reforms. ‘Make in India’ aims to create enabling conditions for both domestic and foreign industries, and attract foreign investments. In no way, it is conceived at the cost of domestic industry. Complementarity in trade is the most critical element to examine before getting into any trade agreement. Lack of complementarity may make things work the other way round. There is no assessment on this aspect placed in public forum in the context of RCEP. Rather, the rise in India’s trade deficit with its FTA partners is attributed to imports of final products that are cheaper than the domestically produced ones. On the other hand, cheaper intermediate goods can rather help in making Indian exports competitive. 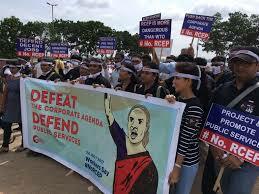 The issue of trade liberalisation with services is still a matter of contention among RCEP nations. In the FTAs with East and South-East Asian economies, beginning with Singapore in 2005 to the last one signed with South Korea in 2011, India has been insisting on capitalising on its pool of skilled labour from improved access to employment opportunities in these economies. This has been expected to come about by increasing the ease of movement of professionals through the liberalisation of what is called Mode 4 in services trade. To this end, India has been willing to trade up its remaining tariff policy manoeuvrability in the manufacturing industry (and even in the agricultural sector). Under RCEP, India has sought binding commitments to simplify services trade. However, given the conditions of the manufacturing and agriculture sectors, it is definitely not a good idea to sacrifice their causes for services. This is prone to promote a skewed nature of sectoral growth. Axiomatically, “preferential trade agreements” (PTAs) are not really the best moves for “small” economies (ones that are “price-takers” than “price makers” in the global economy). India, despite its huge population and increasing income levels, is a price-taker in global trade, especially in commodities. Neither could the nation wield forces to affect global commodity prices, nor does it have world-class global price discovery platforms. For such a price-taking economy, a preferential reduction of trade barriers with partners in a PTA tantamounts to raising the relative trade barrier against non-member countries. On the other hand, RCEP in the long run goes far beyond trade liberalisation. In its attempt to harmonise foreign investment rules, intellectual property rights (IPR) laws, and several other laws and standards, beyond what has been agreed by developing countries at the WTO, it takes away an economy’s ability to customise trade policies according to the needs of specific time periods. This will be another long-term cost that the Indian economy has to bear. Therefore, there are several costs that may arise in the short and long run, and they need to be accounted for before India launches for RCEP. The writer is Director, Observer Research Foundation, Kolkata.